SCVHistory.com | Bouquet Canyon | Juvenile Probation Camp Joseph Scott to Open, 1958. Juvenile Probation Camp Joseph Scott to Open. Dedication May 12, 1958 | News Reports. Camp Joseph Scott was built either on or directly next to the location of the long-defunct New Era School. Second Big Boys Camp Ready to Go. Dedication is Fixed for May 12. The Newhall Signal and Saugus Enterprise | Thursday, May 8, 1958. 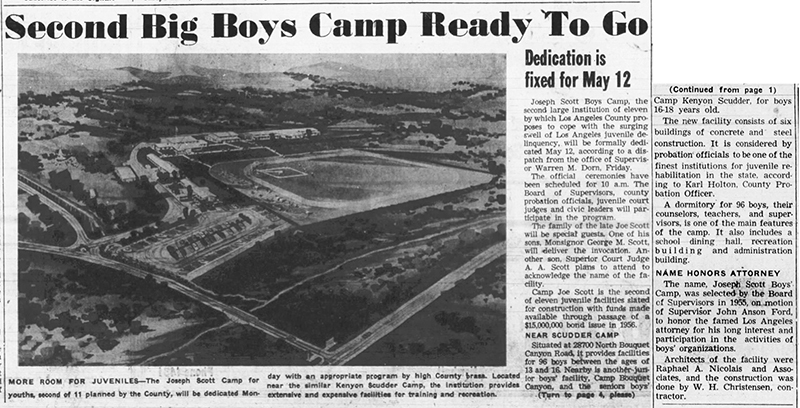 Joseph Scott Boys Camp, the second large institution of eleven by which Los Angeles County proposes to cope with the surging swell of Los Angeles juvenile delinquency, will be formally dedicated May 12, according to a dispatch from the office of Supervisor Warren M. Dorn, Friday. The official ceremonies have been scheduled for 10 a.m. The Board of Supervisors, county probation officials, juvenile court judges and civic leaders will participate in the program. The family of the late Joe Scott will be special guests. One of his sons, Monsignor George M. Scott, will deliver the invocation. Another son, Superior Court Judge A.A. Scott, plans to attend to acknowledge the name of the facility. Camp Joe Scott is the second of eleven juvenile facilities slated for construction with funds made available through passage of a $15,000,000 bond issue in 1956. Situated at 28700 North Bouquet Canyon Road, it provides facilities for 96 boys between the ages of 13 and 16. Nearby is another junior boys' facility, Camp Bouquet Canyon, and the senior boys' Camp Kenyon Scudder, for boys 16-18 years old. The new facility consists of six buildings of concrete and steel construction. It is considered by probation officials to be one of the finest institutions for juvenile rehabilitation in the state, according to Karl Holton, County Probation Officer. A dormitory for 96 boys, their counselors, teachers, and supervisors, is one of the main features of the camp. It also includes a school dining hall, recreation building and administration building. The name, Joseph Scott Boys' Camp, was selected by the Board of Supervisors Of Supervisors in 1955, on motion of Supervisor John Anson Ford, to honor the famed Los Angeles attorney for his long interest and participation in the activities of boys' organizations. Architects of the facility were Raphael A. Nicolais and Associates, and the construction was done by W.H. Christensen, contractor.